April 18, 2016 – Plant pillows containing ‘Tokyo Bekana’ Chinese cabbage seeds for NASA’s third vegetable plant growth system experiment, Veg-03, were delivered aboard the SpaceX Dragon cargo craft during its eighth Commercial Resupply Services mission to the International Space Station on April 8. The International Space Station’s Vegetable Production System (“Veggie”) experiment is a deployable plant growth unit used to grow salad-type crops to provide the crew with appetizing, nutritious and fresh food and support crew relaxation and recreation. Veg-03 will continue NASA’s deep-space plant growth research to benefit the Earth and the agency’s journey to Mars. Future long-duration missions into the solar system will require a fresh food supply to supplement crew diets. 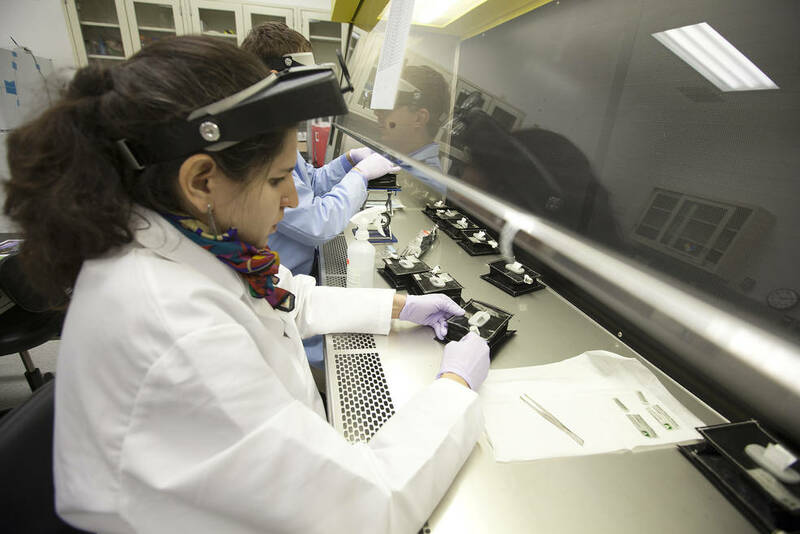 Understanding how plants respond to microgravity is an important step toward that goal. Veg-03 expands on previous validation tests. The Veg-01 experiment launched in 2014 contained ’Outredgeous‘ red romaine lettuce seeds that were grown by Colorado astronaut Steve Swanson. The lettuce leaves were harvested and brought back to Earth for testing. Discussions with space microbiologists, flight surgeons, and space food technologists indicated that the crew should be able to consume the fresh produce with precautionary sanitizing using on-orbit Prosan wipes since microbial levels in the returned samples were sufficiently low. In August 2015, the Veggie plant growth experiment yielded fresh lettuce for crew consumption. Expedition 44 crew members, including Colorado astronaut Kjell Lindgren, sampled the fruits of their labor after harvesting a crop of “Outredgeous” red romaine lettuce Monday, August 10. This flowering crop experiment began on November 16, 2015, when Lindgren activated the Veggie system and its rooting “pillows” containing zinnia seeds. 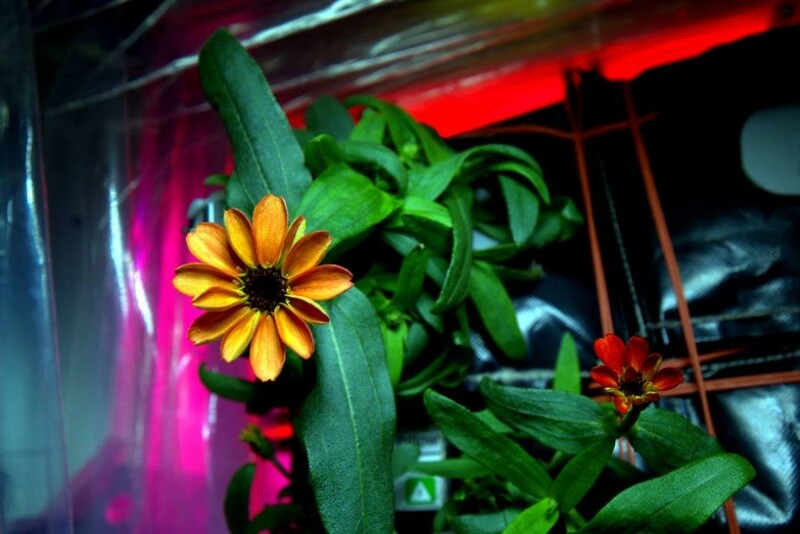 The challenging process of growing the zinnias provided an exceptional opportunity for scientists back on Earth to better understand how plants grow in microgravity, and for astronauts to practice doing what they’ll be tasked with on a deep space mission: autonomous gardening. “Veg-03 will build on former crewmember Scott Kelly’s autonomous gardening by testing similar gardening procedures with the leafy greens. We are hopeful that the station crewmembers will like the Chinese cabbage,” said Trent Smith, Veggie project manager. Inside a laboratory at the Space Station Processing Facility, the Veg-03 science team, including Massa, NASA postdoctoral fellow Dr. Matthew Mickens, and Matthew Romeyn, a NASA Pathways intern from the University of Edinburgh in Scotland, inserted a wick into each of the 18 pillows and then measured a precise amount of calcined clay, or space dirt, and fertilizer, and inserted the mixture into each pillow. Each plant pillow was sealed by sewing the open end shut. The science team sanitized the cabbage seeds, along with additional ‘Outredgeous’ lettuce seeds, and then planted two seeds into each of the wicks before sealing the pillows in gas-impermeable bags and transferring them to the Engineering Services contractor for packing into a cargo transport bag. Twelve pillows of Chinese cabbage and six of lettuce were sent to the space station. Some of the Chinese cabbage and red romaine lettuce seeds that were prepared at Kennedy Space Center were also shipped to the White House about a month ago. 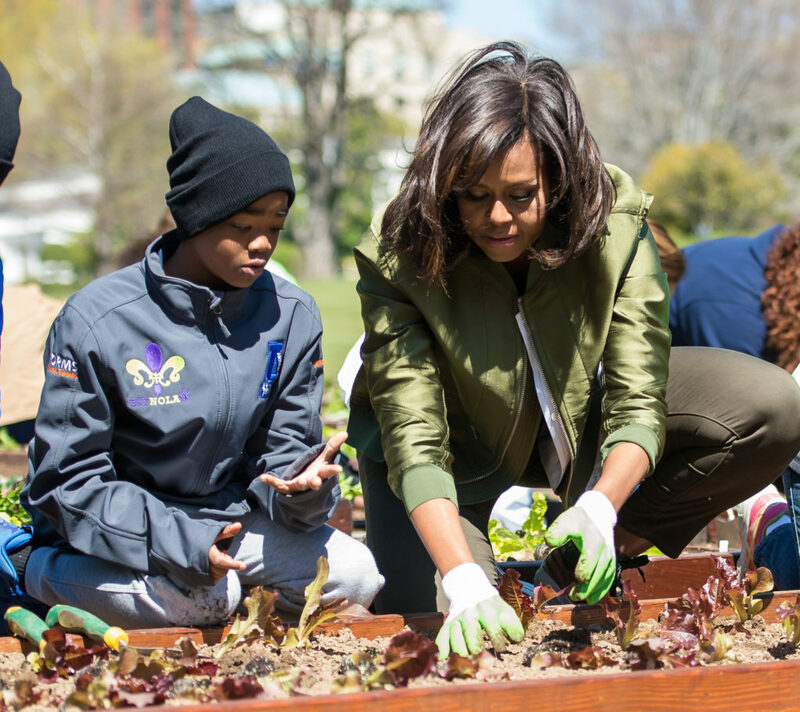 The First Lady, NASA Deputy Administrator Dava Newman, and astronaut Cady Coleman helped plant the seedlings with a group of students from across the country. The Veggie system was developed by Orbital Technologies Corp. (ORBITEC) in Madison, Wisconsin, and tested at Kennedy Space Center before flight. ORBITEC is a wholly-owned subsidiary of Sierra Nevada Corporation. Both ORBITEC and KSC have been involved in plant growth optimization of the Veggie hardware, and testing and collaboration have resulted in the development of the pillow planting concept to interface with the Veggie hardware. Wheeler worked with engineers and collaborators to help develop the Veggie unit from a Small Business Innovative Research project with ORBITEC. Massa and others worked to get the flight unit developed and certified for use on the space station. The purple/pinkish hue surrounding the plants in Veggie is the result of a combination of the red and blue lights, which by design emit more light than the green LEDs. Green LEDS were added so the plants look like edible food rather than weird purple plants. 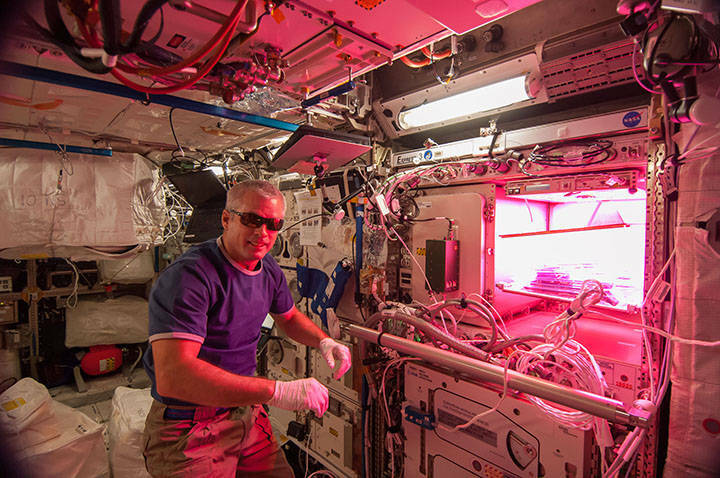 Aboard the space station, crew members insert the plant pillows into the Veggie plant growth system, activate the system’s LED lights, add water, and regularly monitor and care for the growth of the plants. Pillows of different sizes have been designed to accommodate a wide variety of plant types and different types of growing media. An identical ground control set of pillows will be activated in the Veggie ground control unit in a controlled-environment chamber in the SSPF when Veg-03 is activated on the station.